Amsterdam has many markets and they are a reflection of the local society. As diverse as the local people of Amsterdam are, as rich of colors, smells and looks the markets are. Some are general markets and some are speciality markets, but all have their own character. The markets in Amsterdam are spread across the city, but the most popular markets can be found within the City Ring. You should complete your Amsterdam trip, by strolling down the markets and experience the real local feeling. Located in the Pipe area, you can find Amsterdams largest and most popular market. The market has over 250 stands and is open six days a week, from Monday till Saturday. Here typical Amsterdam inhabitants sell almost everything, from freshly made Dutch stroopwafels (syrup waffles) to pillows and Vietnamese snacks. The Bloemenmarkt (Flower market) is centrally located at the Singel canal and open seven days a week. Although the local people don’t visit this market much, it is one of Amsterdams most popular markets. Daily many tourists visit this market, because it is an extraordinary market. This is since they mainly sell flowers and the stalls are floating on the water. Noordermarkt is open two days a week. On Monday it is a flea market where people can buy used goods, antiques and other second-hand goods. Saturdays the Noordermarkt get’s even more exciting. 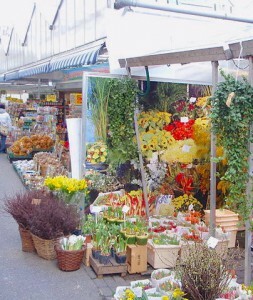 This day people visit the market for organic food and other surprising shopping goods. Every Friday of the week you can find the book market on the Spui and in front of the begijnhof (beguinage of Amsterdam). This market offers about two dozens booksellers, trying to sell their collection of old, rare and second-hand books. In the east of the city, close to the Oosterpark, you can find the Dappermarkt. The area is culturally diversed and therefore has a wide range offer world product to offer. Located in the Jordaan area, there are over 200 stalls forming the Lindengracht market. The market is longer than 900 meters and offers all sorts of products. The largest daily flea market is the one at the Waterlooplein square. The market is centrally located in the center and in the direct vicinity of the metro stop Waterlooplein. At this flea market you can spend hours trying to find the next undiscovered Vincent van Gogh painting. On weekdays the Nieuwmarkt houses a small market. In the middle of the old city center people can buy basic goods, such as cheeses, vegetables and flowers. People who visit the Haarlemmerplein on Wednesdays will be pleased with a weekly organic food market. Sellers offer a wide variaty of high-quality food, such as cheeses, wines, meat, bread, fruit and vegetables. The Antiekcentrum (Antiques center) is an indoor market, located in the Jordaan. Inside there are about 70 stands with people selling their antiques, curiosities and all kinds of art pieces. The Oudemanhuispoort is a covered passageway in the city center. Each Saturday people can visit the weekly book market, for old and used books. Each Wednesdays and Saturdays sellers and collectors of stamps and coins gather here on this market at the Nieuwezijds Voorburgwal. Just outside the Jordaan area at the Ten Katestraat there is a daily market, with more than 100 market stalls. Here it is possible to buy all sorts of food, flowers, plants etc. This tiny market at the Sumatrastraat, in the east of Amsterdam, offers 3 to 5 stalls. Far away from the city center, there is the market at the square Plein 40-45. Each week from Tuesday till Saturday sellers offer various products to local people. In the heart of the Bijlmer (part of Amsterdam) there is the colorful market in front of the city hall. The market is a projection of the local inhabitants and therefore the sellers offer products from all over the world. Quite a large market of approximately 120 stalls and located at the Bos en Lommerplein square in Amsterdam West. Two-weekly various goods are offered to mainly local people. The Tussenmeer is a nice shopping street in the west of Amsterdam. On Tuesday many locals buy their fruits, vegetables, flowers and more at this local market. A small weekly market in the west of Amsterdam, with stalls that offer various goods. Just around the corner of the Noordermarkt in the Westerstraat, you can visit the Lapjesmarkt (fabric market). Every week on Monday creative people visit this speciality market, to find fabrics. But also non-creatives visit the market, since sellers also offer vintage and new clothes. Combine leisure shopping with market strolling at the Buikslotermeerplein. This market is located in one of Amsterdams biggest shopping centers, in the North of Amsterdam. Previously the Pekmarkt was the know as the Mosveld market. Nowadays, with the renewal of Amsterdam North, the name and feel is very different. Sellers don’t need special license for the stalls. Therefore you should be prepared to expect everything, from food to musicians. On Friday the stalls are mainly displaying organic food. On the other days there are various goods to buy. The market at the Kraaiennest is a popular market for foreign inhabitants of Amsterdam. On this market you people can buy almost everything from all over the world.Market in the Bijlmer where various goods are sold. The Fazantenhof is one of the many markets in Amsterdam. 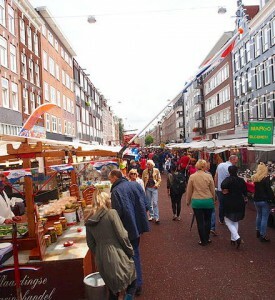 The market is located in Amsterdam Southeast, where a wide range of different products are sold. The Local Goods market is a two-monthly market and is held at De Hallen in Amsterdam. The sellers from this market only offer locally manufactured goods, such as food, furniture and bikes. Developed by Hosteldeals. Powered by Wordpress.